Stressed Out? Then Pick Up A Sword! People often talk about stress. Myself included. But stress isn’t what it used to be. Stand 10 feet away from a man holding a heavy, razor-sharp sword in his hand. Hold a sword in your own hand. Or don’t. It probably won’t matter. Make sure that you have your back to a wall, and that you can’t escape. Ready? Now insult the man’s mother. Or spit on him. Your choice. I’m joking, of course. But do try to imagine the incredible stress of a real sword fight. Imagine your blood pressure soaring, your hands sweating, your mind darting around. Imagine battling all that in addition to battling the enraged man in front of you. I don’t get into very many sword fights these days. Even battle-axe and spear fights seem to be on the decline. Be that as it may, I still find it exceedingly useful to train as though I’m going to be in a sword fight someday soon. In the old days, Kung Fu masters (including Tai Chi masters) would face life-or-death combat on a regular basis. Luckily for us, we don’t often face life-or-death stress like that. Compared to our ancestors, we live pretty cushy lives here in 21st century America. Most of us don’t face life-or-death situations very often. Most of us have enough to eat (or too much), warm beds, indoor toilets, and Netflix. Meanwhile, we get stressed out by the smallest things. More than any other culture in the history of culture, we sweat the small stuff. And it’s not just in our heads. Our reactions are physiological! High-blood pressure, insulin resistance, high levels of cortisol — all of these things are symptoms of real stress. This stress takes its toll on us. It eats us alive, ruining not only our quality of life, but our health. Of course, we can practice Qigong to relieve this stress. And we should. But wouldn’t it be nice to prevent this stress rather than just relieve it? Is there a way to train your mind and your nervous system to *not* overreact in times of extreme stress. Yes. It’s called “stress inoculation,” and it’s one of the reasons that I love the martial arts. Any martial art that includes two-person drills or sparring, whether these are done empty-handed, or with weapons, will offer some sort of stress inoculation. But not all martial arts will do it holistically. For example, while I was testing for my black belt in Goju-Ryu Karate, I had my nose broken by a 5th Degree Black Belt. Blood everywhere, hurt like hell, I had a black eye for a week, and my nose has never been quite the same. Sure, that experience toughened me up. But it wasn’t a healthy way to inoculate me against stress. Certainly, it wasn’t healthy for my nose. For me, the missing piece of the puzzle was a drill called Tui Shou, which translates to “Pushing Hands”. There are many different versions of Pushing Hands, but the idea is always the same. Basically, it’s a form of gentle, upright wrestling where you try to push, off-balance, or throw your partner. But you do this using softness, not with brute strength. Here’s the amazing thing about Pushing Hands. Even when it’s super gentle, even when you’re partnering with a sweet, 60-year-old woman, here’s what’s going to happen as soon as she tries to push you: You’re going to freak out and tense up. It’s a nervous system thing. It happens whether you like it or not. And it happens to the best of us. Pushing Hands is just a drill. It’s definitely not fighting. It’s not even real sparring. But the inoculation that you receive from Pushing Hands is incredibly valuable — and not just for fighting. When someone suddenly swerves out of their lane, or if they’re approaching you too fast from behind and about to rear-end you — you’ll be able to stay calm, and you’ll be able to do what’s necessary to avoid the accident. Speaking of Zombies — I also enjoy training with the various Kung Fu weapons, like the sword, staff, and spear. There’s some measure of practicality to this in the case of a Zombie Apocalypse. If the undead start to walk the earth, you definitely want me on your team. Zombies aside, Kung Fu weapons are also heavier than you’d think, which makes for an excellent form of strength training. But the main reason I like to train with Kung Fu weapons is that it’s another form of stress inoculation. In my own training, some of the most profound glimpses I’ve had into the deeper levels of the art of Kung Fu have come from training with weapons. The Kung Fu solo weapons forms are beautiful to watch. But the applications of the traditional forms are even more amazing. Here’s an impromptu video that a student recently took while I was answering a question about the Kung Fu weapons. The level of concentration required when using weapons is much, much higher. And the margin of error is much lower. On top of all that — you have to remain totally relaxed. If you tense up, if your mind wanders for a split second, then the flick of your opponent’s wrist would be the end in a real fight. And that’s why Kung Fu masters were so interested in stress inoculation. It was a matter of life and death. Stress inoculation is a wonderful thing. It’s almost like a drug. The world starts to feel different. You walk around with a changed perspective. You become a warrior, not a worrier. You start to recognize the small stuff for what it is — small. And so you don’t sweat it. Unfortunately, the concept of the warrior is a tricky one in the 21st century. The word “warrior” doesn’t have the same connotations that it once had. So there’s a lot of confusion. 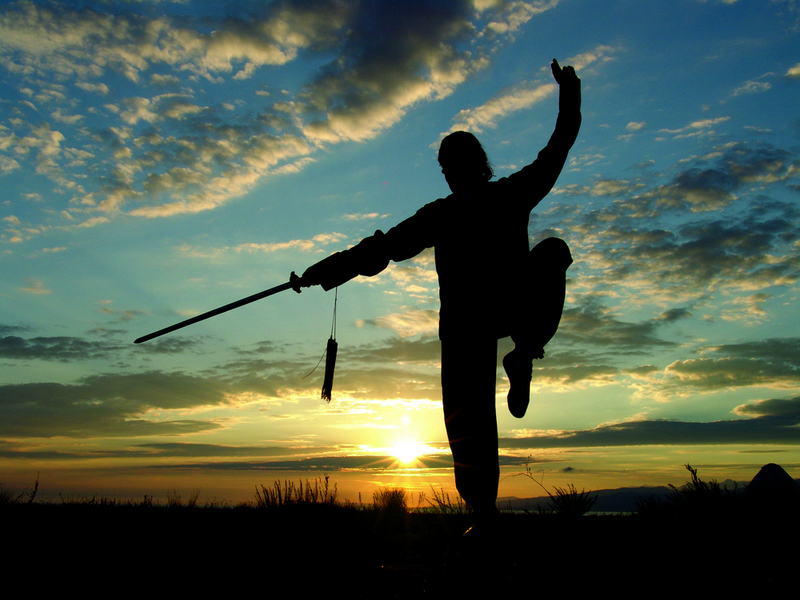 What does it mean to be a warrior, in the Kung Fu tradition? It means that you constantly strive to master your body, your mind, and your spirit. It means that you develop the courage to face dying so that you also have the courage to face living. It means that you have an inner confidence that remains impervious to external factors. It means that, in those rare moments when you might have to defend yourself or a loved one — that you are able to rise to the challenge, whether that means swerving in traffic, standing up for something that you believe in, or defending an innocent person from physical violence — yourself included. What do you folks think about this subject? Does it interest you? Would you like me to write more about the concept of the warrior, and how it applies to the 21st century? Go ahead and leave me a comment below. Yes! Excellent article! This subject interests me a great deal, and I would most definitely enjoy more on it, including training with weapons. The second form I learned from my first Tai Chi teacher (many years ago) was a solo staff form, and I find this type of practice very rewarding. Awesome article! I’d definitely love to read a second part about the concept of a modern warrior. If you want to learn this stuff, then keep practicing the Tai Chi that you learned from me. Without a solid Tai Chi foundation, it’s hard to learn Pushing Hands or weapons. So plan ahead now! I truly enjoyed this! PLEASE continue on! I want to know more ways of being a warrior. .!! I like this article very much. I would also suggest that the stress of living moment by moment and preparing to fight to keep yourself alive may seem worse than what we have now, but is actually healthier and less “stressful.” It’s when you have so many physical amenities that you no longer have to be in the moment keeping yourself alive that your conscious mind begins to wander to the past and the present in order to create depression and anxiety, in that order. Then you start to need things like Tai Chi and Kung Fu to put your mind back into the present and release the worrying and regretting that our modern world has trained into us. Also, I like the idea of the two person training being even more of a stress reliever. It makes sense as a single person drill/form still allows one to zone out, make mistakes, and not be totally in the moment. But when you’re going back and forth with weapons, even if they’re wooden, and as you mentioned, your body will take it as a threat and keep you focusing on the present to avoid injury and death. Neat article. Shows the Yin Yang philosophy in action with using self defense training to aide in being a more calm and peaceful person. Thanks for sharing Shifu! My pleasure, John. And thanks for the insights! You’re right about the yin and yang of self defense! Nice article! I love working with weapons and find it’s a way to console my soul at any time! Please do continue to wriypte about warriors and push hands! Great reading Sifu, like a sponge ready to soak up the information, always interested in the history.